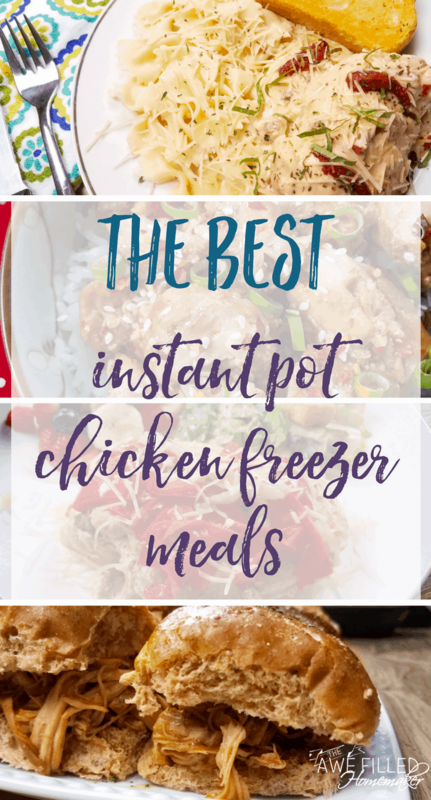 The Best Instant Pot Chicken Freezer Meals + FREE Meal Plan! It isn’t always easy to eat healthy when you are a busy family. Sometimes it is hard to even eat! 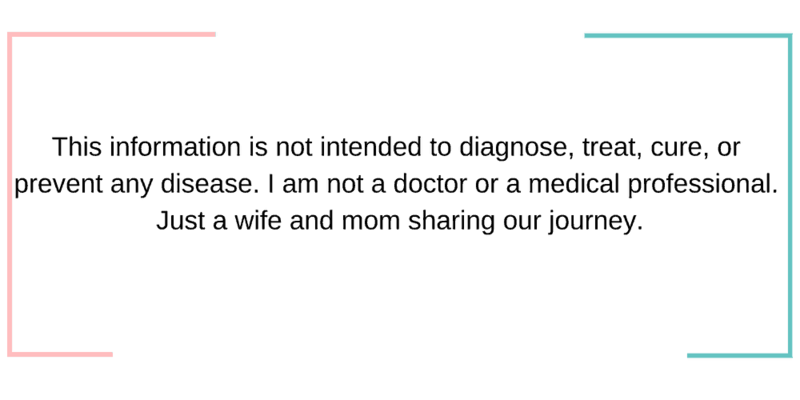 However, with the invention of the Instant Pot– life has gotten much easier! Now, I can also save even more time with devoted meal prep and freezer meals. 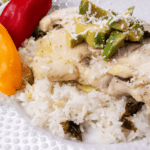 If you are just now joining us for this series, this is the last recipe for now on Instant Pot Chicken Freezer Meals. However, let me catch you up! How to Use the Instant Pot for Beginners-is a great way for you to get to know your Instant Pot buttons and how to use this magical device! 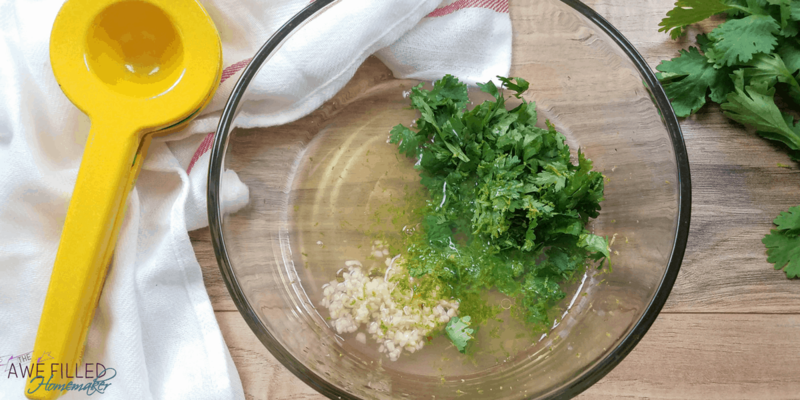 5 Instant Pot Hacks– will give you even more of a break down in hacks for your pot! Instant Pot Cook Times– is a handy chart I have for FREE to help you understand cook times! Meal Planning Doesn’t Have to Be Hard With an Instant Pot– is the first article in my meal prep/freezer meal series! This will give you a break down on getting started with meal prep- in other words the 411! 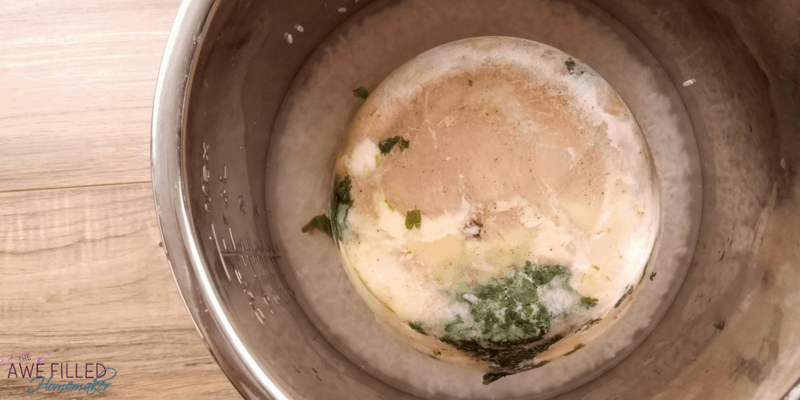 Preparing Freezer Meals with the Instant Pot– was the next up in the series! Don’t miss this one either, it gives a lot more info too. Sweet & Spicy Chicken Bowls– was the first TDF (to die for) freezer meal we shared! It is So, SO good! Creamy Sun dried Tomato Chicken– is the nest recipe we shared. This is another great recipe that tastes wonderful!!! Pulled BBQ Chicken Sandwiches– What else can I say about this one? Seriously! Great for football games, tailgate parties, BBQs, and well- really anytime! 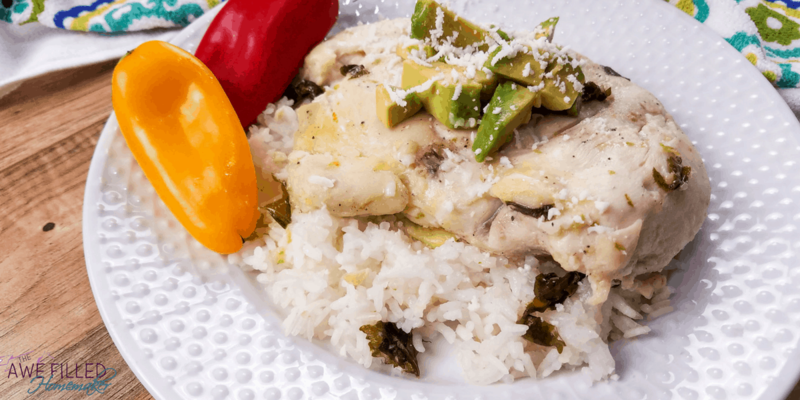 Red Pepper Chicken– I shared this one last week. It is another twist on freezer chicken to give you more variety of using frozen chicken in a delicious, not to miss way! 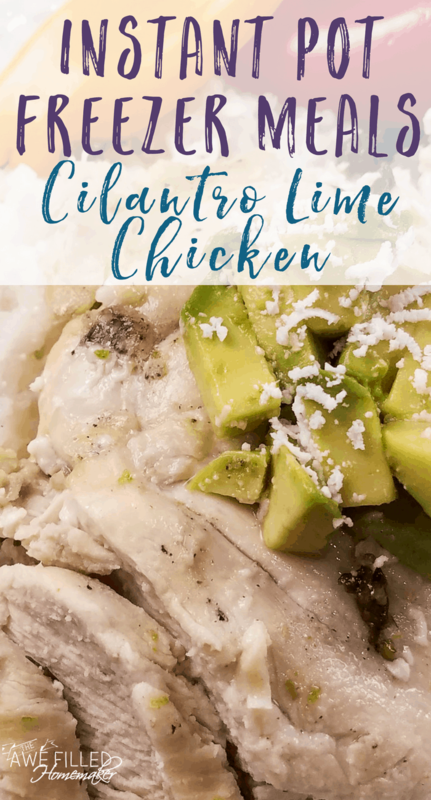 Cilantro Lime Chicken– Keep scrolling! 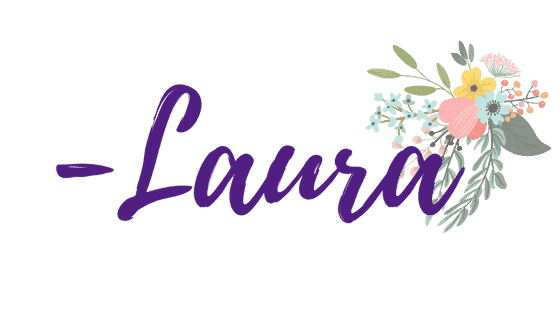 This is BRAND NEW and I am sharing it today! YUMMMM! Todays NEW Recipe is Cilantro Lime Chicken! 1) Combine all the ingredients, minus 1 cup chicken brother and white rice, together in a round freezer safe storage container that fits inside your Instant Pot. Tape the label to the container and freeze until ready to use. 2) Too cook at 1 cup rice and 1 cup chicken broth to the Instant Pot. Remove the chicken from the contain and place on top of the rice in the Instant Pot. Close the lid and turn the pressure valve to sealing. Cook on high pressure using the manual function for 15 minutes. Let pressure release naturally. 3) Top with fresh cilantro, salsa, or avocado and serve. Note: If you do not slice the chicken breasts in half they will be too thick and will not cook all the way with the rice. Don’t Forget to Print out the Recipe to Have Handy! 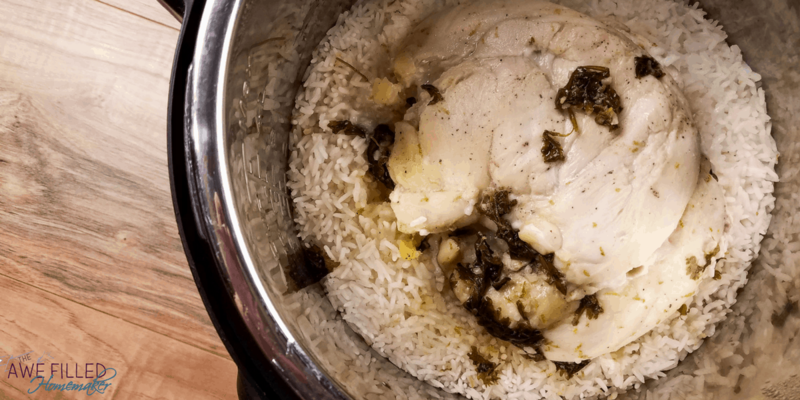 Combine all the ingredients, minus 1 cup chicken brother and white rice, together in a round freezer safe storage container that fits inside your Instant Pot. Too cook at 1 cup rice and 1 cup chicken broth to the Instant Pot. Remove the chicken from the contain and place on top of the rice in the Instant Pot. Close the lid and turn the pressure valve to sealing. Cook on high pressure using the manual function for 15 minutes. Let pressure release naturally. Top with fresh cilantro, salsa, or avocado and serve. If you do not slice the chicken breasts in half they will be too thick and will not cook all the way with the rice. 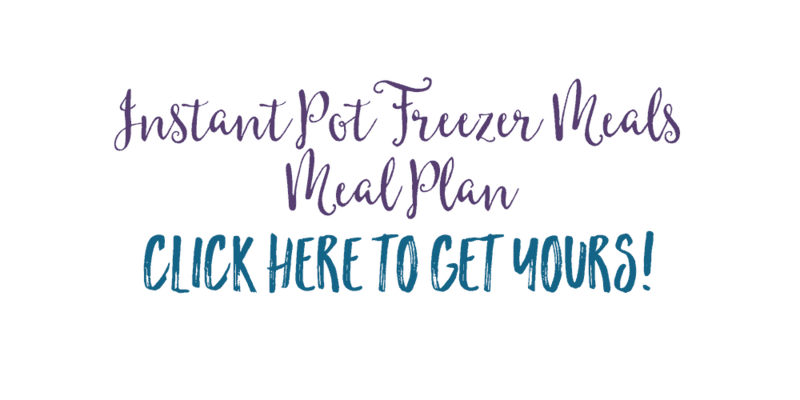 Now before you go- don’t forget to go download your FREE Instant Pot Freezer Meal- Meal Plan!